Vegans can enjoy a relaxing picnic with Laura Theodore's multi-course menu for vegans like this chocolate date-nut lollipops recipe. Put the vegan chocolate chips in a double boiler over medium-low heat. When the chocolate has melted, remove from the heat. Meanwhile, put dates, pecans, and vanilla extract in a high performance blending appliance and process to the consistency of soft dough. Transfer the date mixture to a medium bowl, pour in the melted chocolate, and stir until well-combined. Put the date mixture in the freezer for 7 to 15 minutes or until the chocolate has set enough to roll into small balls. Insert the end of a lollipop stick into each chocolate ball and place all lollipops upright in 2 separate mugs or shallow glasses, making sure they do not touch each other. For a festive presentation, wrap each lollipop in cellophane and tie with a pretty ribbon. 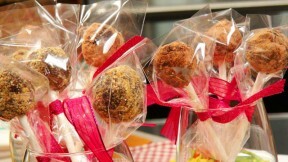 Stored in an airtight container, leftover lollipops will keep for up to 3 days.